With the advent of streaming and the rise of powerhouse players like Hulu, Amazon, and Netflix, the need for new programming has exploded in the last couple years. They are all vying for the best scripts, the best actors, the best directors...and it's a hot market. Coming up with new, creative, and interesting ideas is all the more difficult in such a competitive storm, so it's absolutely no surprise when they turn to older, successful properties as a way to find an audience and compete. After running for nine seasons, from 1993 to 2002, FOX decided that the X-Files was a property that was ripe for return. They brought it back for 5 episodes in 2016, and it paid off - kinda. They returned with an eleventh season this year, but ratings weren't great, fans weren't thrilled, and Gillian Anderson said she was done. As of now there are no plans to give us a twelfth. But it's one of those classic properties, and you know how us sixth scale collectors love our classic properties. A long time ago, in a galaxy far, far away, Sideshow produced a fairly extensive series of figures based on the show, but those looked dated about a month after they were released. The property was ripe for some new blood, and ThreeZero swooped in to take it on. 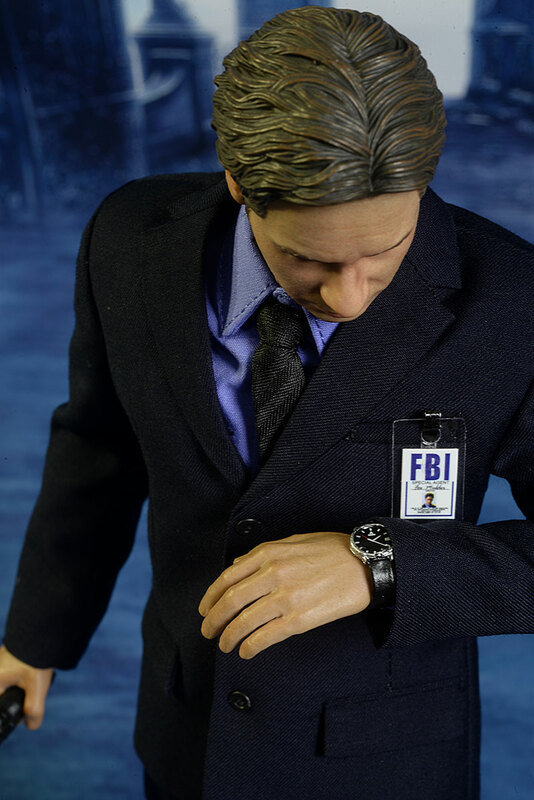 They have just released their Mulder, and Scully should be shipping soon. Whether we see any more in the series is as of yet unknown, but ThreeZero is well known for taking a long time between announcements and releases with any series they produce. 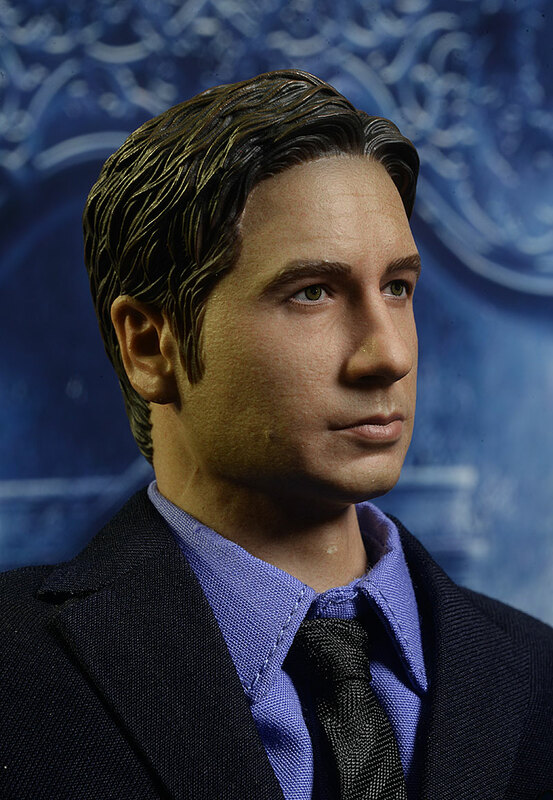 Mulder (and Scully) is available in two ways - the regular release, sold by most retailers for around $160, and the 'deluxe version (reviewed tonight), which sold for around $170. The box is basic stuff, with classic X-Files graphics, a 'deluxe version' sticker, and a collector friendly set of plastic trays inside. The figure and accessories are safe and sound, but there's nothing here to set it apart from the pack. This is one of those portraits that's tricky - from certain angles, it's clearly Mulder. From others, not so much. And part of the issue is the paint, not the sculpt itself. I think the strongest aspects are the lips and chin. 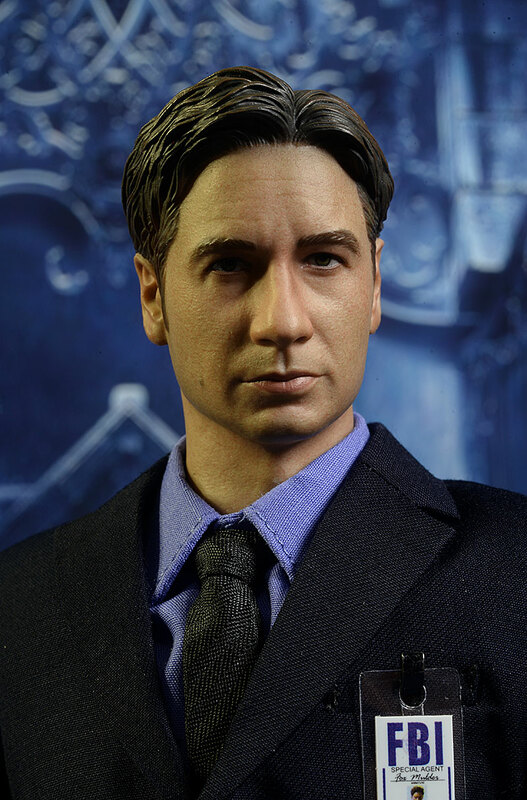 They've clearly captured Duchovny in the lower face, and they gave it the old college try on the nose as well. I think it's a little large, but at least they didn't just go with 'standard white guy nose' and call it a day. I think it's in the eyes and eyebrows that they lose me, particularly the bushy eyebrows. They're dark, darker than I remember and can find in photos, and wider. I do think that's something you could correct with the right paint job though, and reveal a more accurate portrait hiding in there. There's a good skin texture too, adding realism to the face and neck. It's a one piece head/neck sculpt, which some collectors will like more than others. It sacrifices some posability for appearance, a trade off whose acceptance can depend on the character and the collector. The detail work on the hair is good, and the style could apply across a number of seasons. 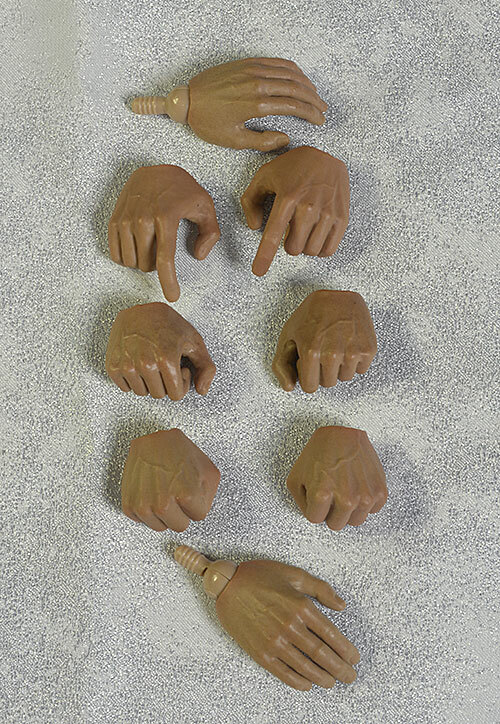 The various hands are designed to work with the accessories, and the figure stands almost exactly 12" tall. I suspect there's a better portrait hiding under the mediocre paint, just waiting for a talented customizer to bring it out. 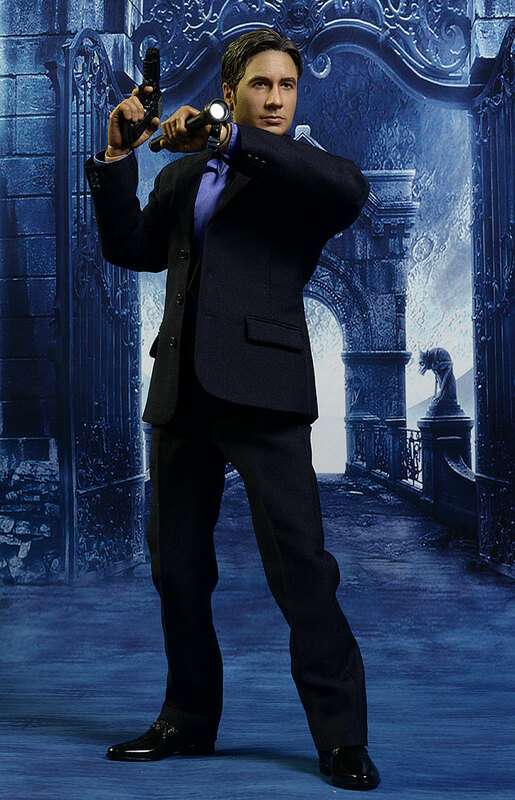 The skin tone is dark, a common situation with ThreeZero figures. It's particularly dark at the top of the forehead, looking too air brushed to me. Rather than creating a subtle transition from hair to skin, it looks like he messed up his spray tan application. The lips look good, but as I said earlier, there's too much eyebrow, and a big reason for that is the thick, dark color of the paint. Add in some less than sparkly eyes, and you have a paint job that leaves me cold compared to the overall market. It's not sloppy, but it lacks the sharp quality we've seen from others. 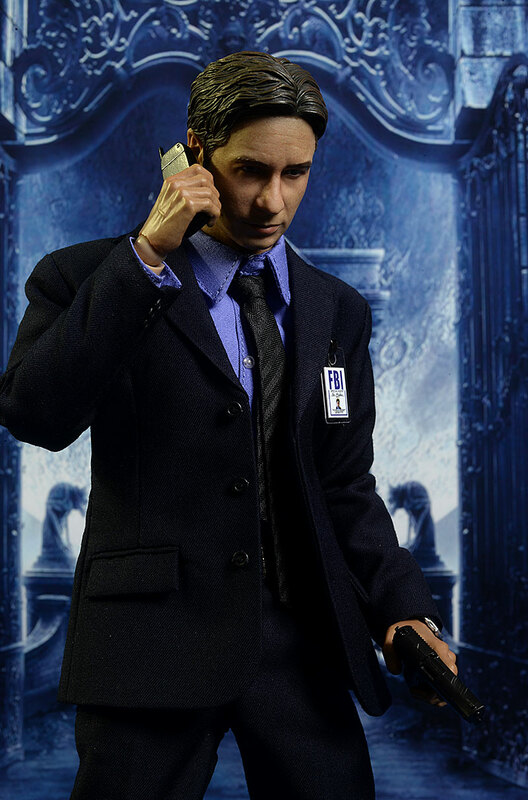 The last couple ThreeZero figures I've looked at have had floppy bodies, and Mulder continues the trend. He has all the articulation you expect (unless you really love the upper neck joint along the jawline), and the arms and torso pose just fine. But his hips, knees, and ankles are loose, not quite rag doll loose like Daryl, but loose nonetheless. It makes it harder to pose him, and harder for him to maintain stances long term. The hands swap easily though, and I had no fear of breakage. They did throw in a couple extra wrist pegs just in case. There's a nice assortment, and the quality is solid all around. He has some extra hands of course, and the scale isn't quite as ridiculous as we sometimes see. He comes wearing open hands, and you can swap in fists, gun grips, or tight grips. These work well with just about all the accessories too. He has two guns, a SIG-Sauer and a Walther PPK. These have good sculpts with removable magazines, pretty much standard stuff. There's a small holster as well, which can be attached to his belt. It's the weakest of the accessories, but serves the purpose. He also has his large Mag flashlight, and an appropriate era cel phone. I really like the phone, with its clear plastic screen and individually printed buttons. The scale on these is good as well. He has a wrist watch, with rubber band and basic face. To identify himself, he has two different badges. He has the laminated ID that clips to his pocket, and the wallet badge with ID. Both of these look good, but I like the wallet piece better. The laminated pocket ID looks fine, but the metal 'clip' doesn't quite work as well as I'd like. They do include an extra though, just in case you lose it. The wallet ID is rubber and a little thick when it is folded over - he won't be carrying it in a pocket. But the printed pieces look great, and while the badge itself could use a little more sculpting on the surface, he looks perfect holding it up in one of the tighter grip hands. 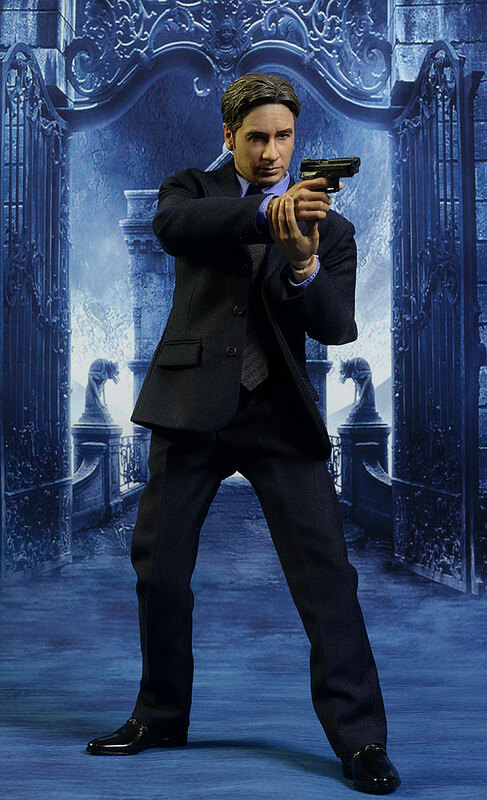 This is the one area where the deluxe has a leg up - this version has a trench coat as an additional costume piece. But let's start with the basics. He's wearing a suit and tie. Big surprise there. However, they've done a nice job with the tailoring particularly with the suit coat itself. The pants are a little long, and you won't get too excited with the belt or blue shirt. They're pretty standard stuff, and while the fit of the tie around the collar is good, is nothing particularly unique. But there's a nice, sharp, crisp fit to the suit coat, with flat lapels and collar, all properly scaled. You know how a nice fitting suit feels fresh from the dry cleaner? Yep, that's how this jacket feels. It's an athletic cut too, with wider shoulders and a narrow waist, which gives it a classier look. The cut of this jacket does pose an interesting question for the display. You'll notice in some of the photos that the coat is buttoned up - this is how he comes in the package. In others, it's open, which is the much more common look for Mulder on the show. So why would you leave it buttoned up? Because, thanks to the crisp cut and tailoring, it looks better buttoned up. It's also worth noting that these are real buttons and button holes, which means once you unbutton it, you're going to have a frustrating time getting it closed back up again. 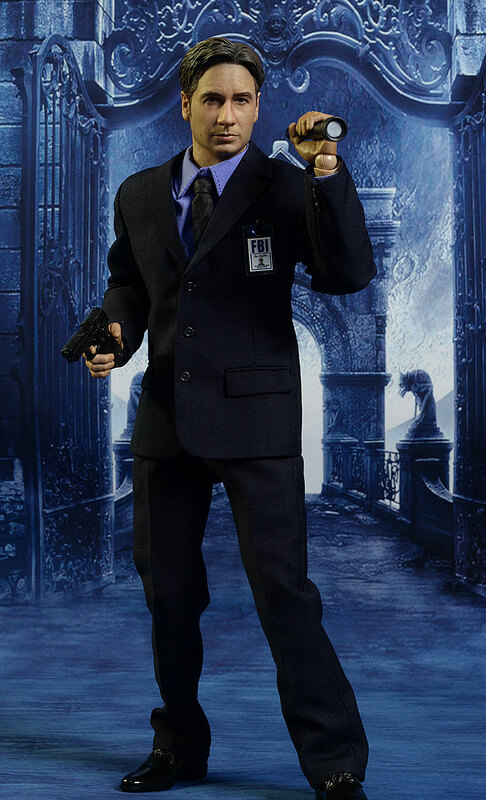 In fact, you'll probably want to go dig up that button puller you got with your John Lennon figure. As much as I like the look of the jacket closed, I suspect I'll end up going with the open coat look for the shelf. It's just more Mulder-esque, but I wanted to show him to you both ways - and point out the potential pitfalls - anyway. 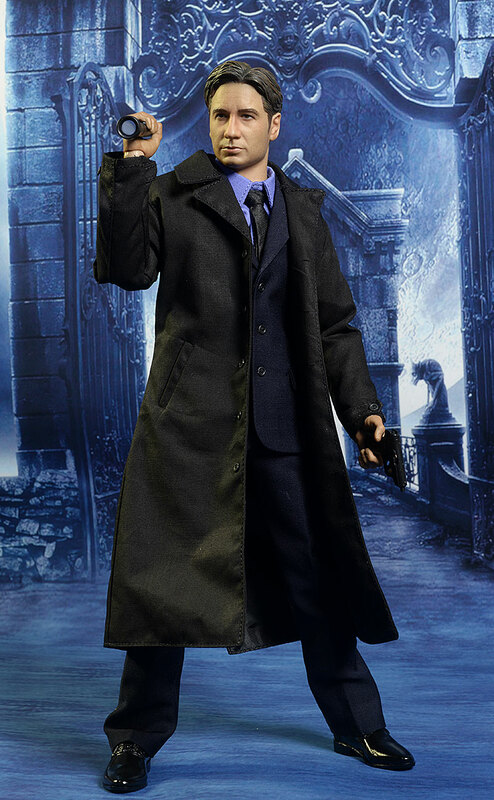 The deluxe version comes with the long trench coat. The material quality is excellent, and it is very thin and light, even with the lining. It fits over the suit easily, and the belt-less look would be approved by Morty Seinfeld. 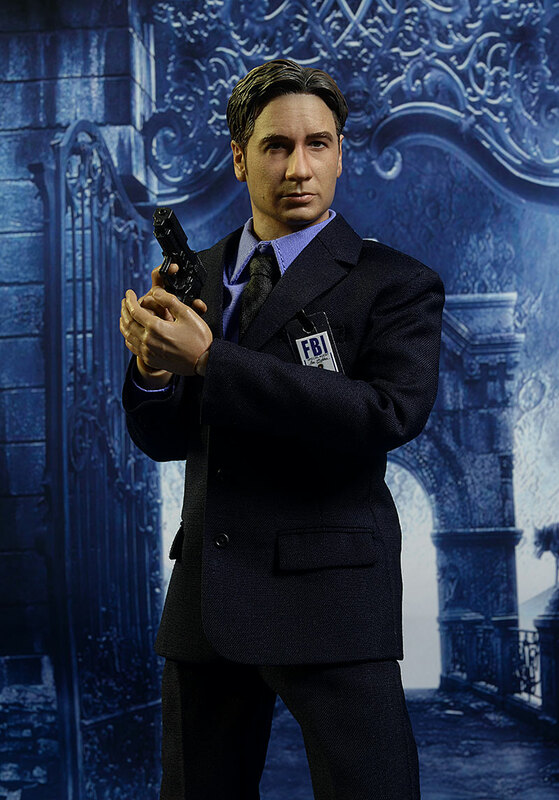 If you're going for the deluxe Mulder, I'd pick up the deluxe Scully too, since then they'll both have their long coats. And yes, he's as puzzled as you are in the next photo...why am I wearing my watch upside down? It must be proof of alien abduction! While the floppy legs can be annoying, they aren't as bad as some of the rag doll releases we've seen. You can get him to pose and stay there, but it takes a little more effort. 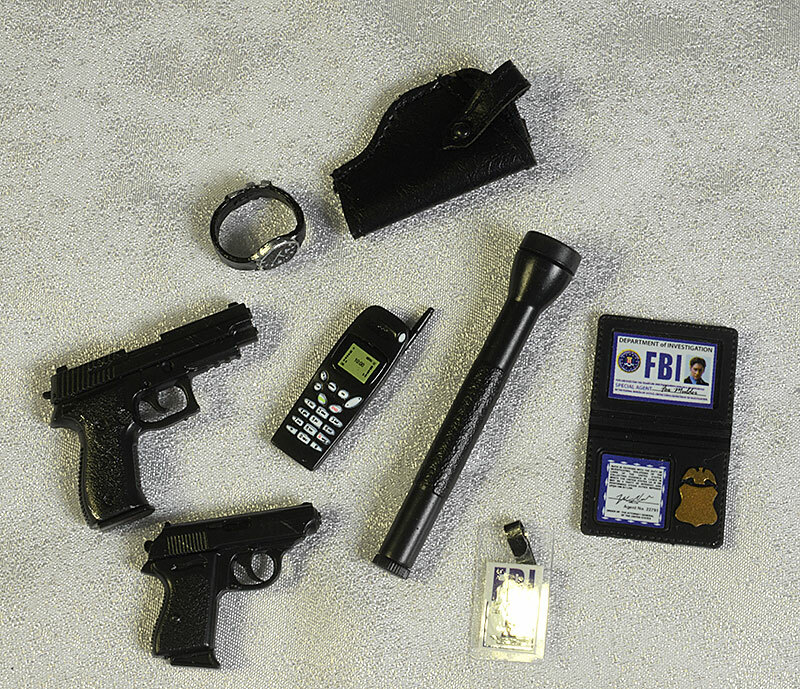 The accessories are all very useful, and you can come up with ways to use the phone, badge, guns, and flashlight in just about any display. Here's an area where this figure gets a big boost. While most other figures - even from second tier companies - are coming in around $220 - $240, ThreeZero is keeping their releases down under $180. 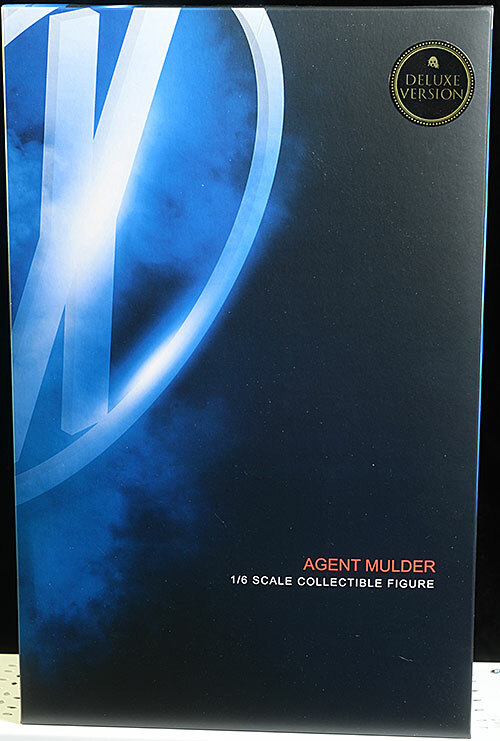 With the regular Mulder at $160 and the exclusive only a few bucks more, you're getting a solid value, well above the market average right now. 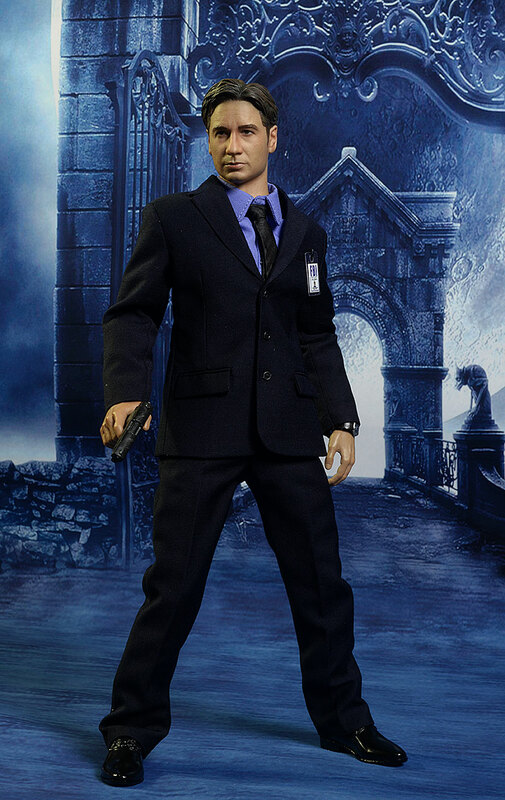 He isn't Hot Toys quality, but he's certainly worth the price they are charging plus some. Not much. As I mentioned, you probably want to decide if you want the jacket open or closed and stick with it, since buttoning it can be quite the trick. This figure is a solid release, but needs a few improvements. Most collectors will swap out the body thanks to the floppy legs. And if you're particularly adventurous (or simply way more talented than me), a repaint of the head will go a long way to improving the portrait. Lighter skin, a better hairline, and softer, thinner eyebrows might allow a better sculpt to shine through. I'm not sure if we'll see this line go beyond Scully, but having the iconic duo on the shelf will be enough for me. The deluxe version, with the addition of the coat, isn't necessary, but if you pick up one in the deluxe format, I'd get the other as well for consistency in the display. While the old Sideshow figures aren't as good, a repaint and a better suit on several of them will at least make them passable next to these. - has him for $160 (regular version). - Entertainment Earth also has just the regular version for $168, but with free shipping. 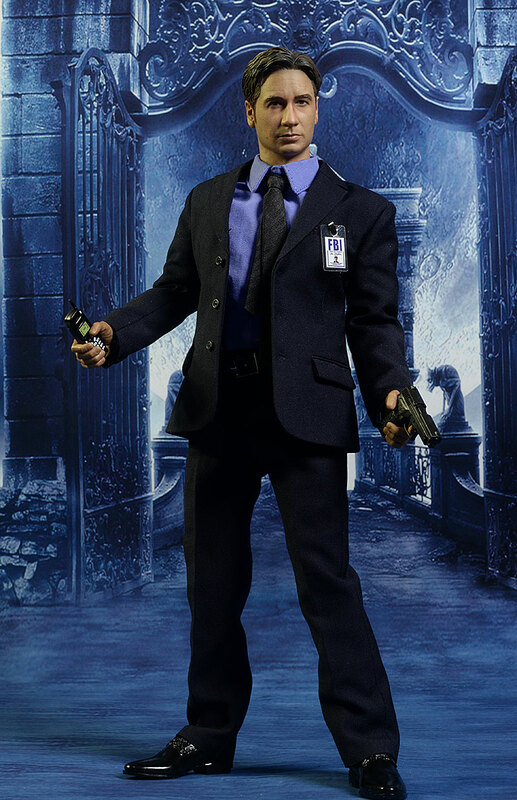 This is the first time in a long time that we've seen any X-Files action figures. 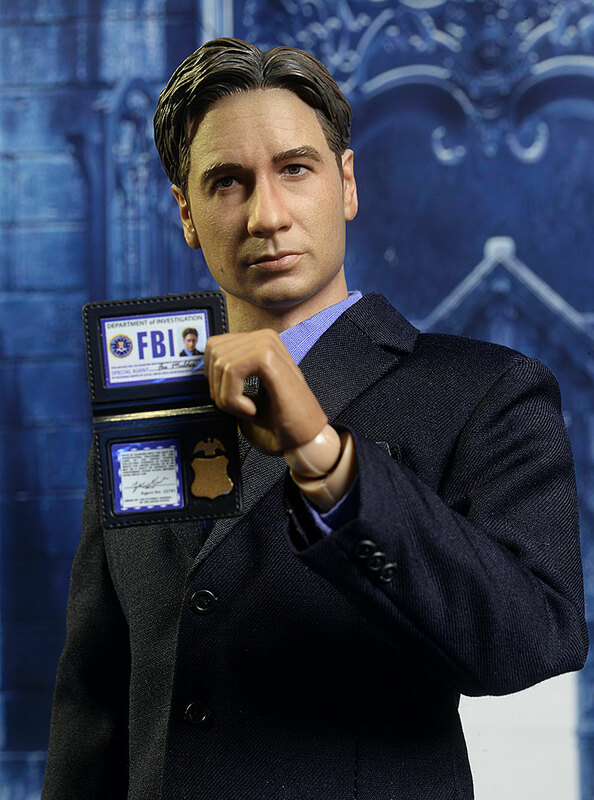 Back in the day, Sideshow did a series including John Doggett, Frank Black, the Cigarette Smoking Man, and Scully and Mulder.